Meetings can be very successful, making those involved feel part of a team; or they can be disastrous, leaving everyone present feeling confused and frustrated. To make the most of your meeting it is important to put some thought into what the meeting is supposed to accomplish, who should attend, what should be discussed, where the best place to have it is, and when would be the most convenient date and time. 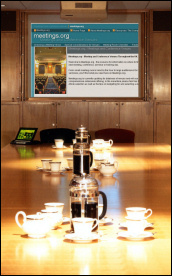 Having decided on the basics, equally important is how the meeting is chaired. If you are the chair ensure that you arrive in plenty of time. Great everyone warmly and ensure that everyone is comfortable and able to pay attention without distractions. Use your opening remarks to set the tone of the meeting, establish the purpose and then review the agenda. Give a short overview of each topic and what you need to achieve. For example, for the first item on the agenda does a decision have to be taken or are you just looking to brainstorm? During the meeting it is important to pay attention to the structure of items. For example, a step by step approach to problem solving encourages people to develop and evaluate alternative solutions. Without this, the meeting can dissolve into a free for all with the strongest voice dominating; or no ideas being generated; or the item being put on hold until the next meeting. 1. Define the problem, significant causes, how it happened. 2. Gather information by asking everyone for input. 3. Develop alternatives by pulling on everyone's ideas and opinions. 4. Evaluate the alternatives suggested. 5. Select the best option out of the alternatives suggested. 6. Plan the next steps for action and who is responsible. 7.	Review progress at a specified date. It is also up to the chair to keep control of the meeting, encourage open discussion and discourage disruptive or negative behaviour. It is your job to get people to contribute effectively and encourage diverse points of view. At the end of the meeting summarise the topics discussed, actions agreed and those responsible. Thank everyone for coming and, if necessary, agree on the next meeting date. Meeting minutes are very helpful as a reminder to everyone of what happened during the meeting and what is meant to be done now, by whom and by what date. It is good practice to circulate the minutes as soon as possible after the meeting has taken place. Remember it is no longer necessary to wait for everyone to be in the same location to have a meeting. Teleconferencing and web-conferencing have become more affordable or even free, such as this UK Conference Call Service, which provides conference calls with no booking, no billing and no fuss!